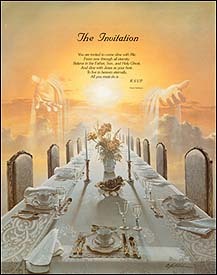 Danny Richard Hahlbohm (American artist, 1949- ), "The Invitation," available as a poster. In each of the Synoptic Gospels and in 1 Corinthians 11, the Words of Institution look forward to a fulfillment in the future. A key element in our own celebration of the Lord's Supper is future-looking as well. Let's explore this. You find echoes of this prophecy in the Old Testament and the New, finally being fulfilled in Revelation with the Marriage Supper of the Lamb (Revelation 19:6-9) and the New Heavens and the New Earth (Revelation 21:4). "Blessed is the man who will eat at the feast in the kingdom of God" (Luke 14:15), comment by a dinner companion. Yahweh will recline at table, the patriarchs and the righteous at His feet,2 and "They will recline at table and eat in Gan Eden,"3 rabbinical commentary on Exodus. "The feast of our God, which He will prepare for the righteous, has no end,"5 Midrash on Esther. Parable of the Great Banquet. At a dinner to which Jesus was invited, he told his host not to invite those who could invite him back so that he would be rewarded "at the resurrection of the righteous" (Luke 14:14). One of the guests remarked: "Blessed is the man who will eat at the feast in the kingdom of God" (Luke 14:15). Jesus followed with the Parable of the Great Banquet (Luke 14:18-24, partial parallel in Matthew 22:2-14), the point of which was that the Jews (who had been invited to the banquet but made excuses) would be displaced by the Gentiles. Q1. Why are so many of Jesus' teachings oriented toward the future? What kinds of associations come to mind as you think of the Great Banquet? "Fulfillment" is the verb plēroō, "to make full." Here it could have one of two meanings: "to bring to a designed end, fulfill" a prophecy, a promise, etc., or "to bring to completion an activity in which one has been involved from its beginning, complete, finish. "8 Indeed, the Lord's Supper is fulfilled at the Great Banquet. This gathering of the redeemed of the Lord in the presence of God on the Last Day is the culmination and fulfillment of the incarnation, the cross, and the resurrection. Q2. (Luke 22:16) In what sense does the Lord's Supper find its "fulfillment" in the Great Banquet at the end of the age? What should this do to our thoughts at the Lord's Table? I'm saddened by the many Christians who, for one reason or another, no longer attend church. The church is flawed, they've been hurt in the church, the church is filled with hypocrites, and so forth. And these things are too often true! But we are not to give up on Christian fellowship. For in our future is a seat at the Great Banquet with millions of other fellow believers. Isn't it ironic that we would separate ourselves now from those with whom we'll share the Feast and an eternity in heaven? The essence of a banquet -- and of the Lord's Supper -- is not food on which to gorge ourselves, but the joyful fellowship of those at the table. The Lord's Supper is our reminder that this life isn't "as good as it gets." Just as the seal of Holy Spirit is your guarantee of future glory (Ephesians 1:13; Romans 8:23; 2 Corinthians 1:22), so the piece of bread and portion of wine you hold in your hands are a token of your ticket to the Great Banquet at the end of the age. The Lord's Supper looks backward as a remembrance to the death of Christ for our sins. It looks to the present as a communion with the living Christ, and it looks to the future as a promise of eternal life in the presence of God. Q3. In what sense does the Lord's Supper point to the past? How does it point to the present? How does it point to the future? Q4. (Revelation 22:4) When you meditate on "seeing his face," what thoughts come to mind? Why should the Lord's Supper stimulate these thoughts every time we partake of it? Father, so often our minds are focused on our own needs and problems. Henceforth, may the Lord's Supper turn our eyes instead to the Great Banquet and the culmination of all things in you. Maranatha. Come soon, Lord Jesus! Amen. Exodus rabba 25 on 16:4, cited by Rudolf Meyer, kolpos, TDNT 3:824-826, fn. 8. Exodus rabba, 25 on 16:4, in Strack and Billerback IV, 1148, cited by Johannes Behm, esthiō, TDNT 2:689-695. Slavic Enoch 42:5 Cited by Johannes Behm, deipnon, TDNT 1:35. Also, "The Lord of spirits will dwell over them, and they will eat and lie down and rise up to all eternity with that Son of Man," Ethiopian Enoch 62:14 Cited by Johannes Behm, deipnon, TDNT 1:35. Midrash Esther 1, 4 Cited by Johannes Behm, deipnon, TDNT 1:35. In Pesikta rabbati, 41, a collection of homilies, where Jacob is invited to the feast of redemption (Strack and Billerback, IV, 1154; I, 878f. Cited by Johannes Behm, deipnon, TDNT 1:35). "Entry into the kingdom, whether a door is mentioned (Matt. 25:10) or not, usually implies entry into the festive hall for the eschatological banquet (Matt. 7:7-8; 22:12; 25:10, 21ff. ; Luke 13:24-25; 14:23)." Joachim Jeremias, TDNT 3:173-180. Rudolf Meyer, kolpos, TDNT 3:824-826; Gustav Stählin, agapaō, TDNT 9:113-171.
plēroō, BDAG 828-829, 4.a or 5. Gerhard Delling, plērēs, ktl., TDNT 6:283-311. "O I Want to See Him," words and music by Rufus H. Cornelius (1916). Another gospel song on this theme is "All Things Are Ready, Come to the Feast," words by Charles H. Gabriel (1895), music by William A. Ogden.